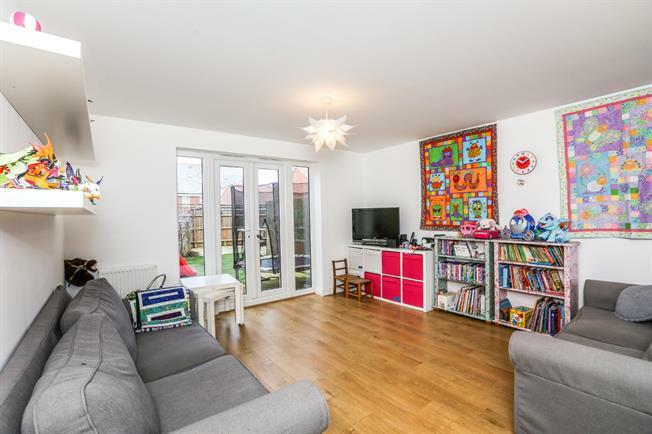 4 Bedroom Terraced House For Sale in Biggleswade for Offers in excess of £370,000. This unique style four bedroom family home offers spacious accommodation over three floors and boasts a large balcony opening from the living room. Internally the property offers a large kitchen/diner, two reception rooms, two bathrooms, downstairs W/C and four double bedrooms with en-suites to bedrooms one and two. Further benefits include granite work tops in the kitchen, an enclosed rear garden, gas central heating, double glazed UPVC windows and a garage with parking. UPVC front door, Stairs leading to first floor. Granite work surfaces, wall and base units, one and a half inset sink with drainer, integrated electric double oven, integrated gas hob, over hob extractor, integrated standard dishwasher, integrated washer dryer and fridge/freezer, pantry cupboard. Low level W/C, wash hand basin, tiled splashbacks. UPVC double glazed French doors leading into the garden, storage cupboard. Single shower enclosure, low level W/C, wash hand basin, tiled splashbacks. Panelled bath, low level W/C, wash hand basin, tiled splashbacks. UPVC double glazed French doors opening onto a balcony.